Total haul - click for larger image. I purchased the Etude House Drawing Eyebrow Refill in Black Brown from WorldMarket201010 on Ebay because I found the Eyebrow pencil to be slightly reminiscent of the Anastasia Brow Wiz pencil, but for a much more affordable price. I bought this on 7/17/13 and it just arrive on 7/29/13 (12 days is super speedy for overseas shipping, so they get major props! ), and it came with 3 samples from TonyMoly! 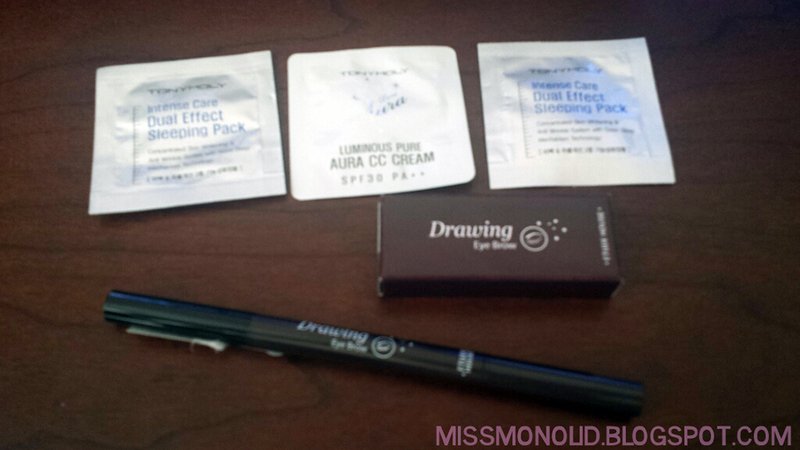 I'm super happy at the speed of the shipping and the samples, seeing that I only paid $3.55 for the refill. I have also bought the actual pencil in Black for $3.91 on 7/19/13, but from a different seller, which arrived today 7/30/13, but with no samples. Anastasia Brow Wiz - click for larger image. I wanted a Anastasia Brow Wiz quite badly, mostly because the only thing that really matched my brows was an eyeshadow in a NYX palette (believe me, I've tried my share of eyeliners also), and it was a lot more work to draw on brows than just using a pencil type applicator and spoolie-ing, but I couldn't justify spending the $21 on what essentially was an eyeliner with a spoolie attached, so, I started my witch-hunt for the perfect low-cost alternative. 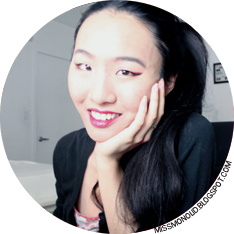 Overall, I like the Etude House Drawing Eyebrow Pencil more than the Anastasia Brow Wiz because as it is an asian cosmetics brand, they have more colors that are suitable for asian coloration. 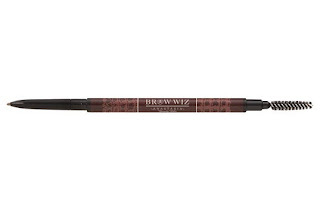 I don't want to come off as racist, but I find that Anastasia Brow Wiz usually looked a little bit browner/redder or lighter than what I want my brow color to be and I cannot use the ebony color, especially since I have my hair dyed a little reddish. 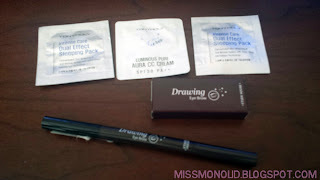 Etude House Drawing Eyebrow Pencil is a very nice alternative for me. 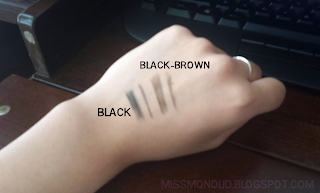 Brow pencils swatched - click for larger image. 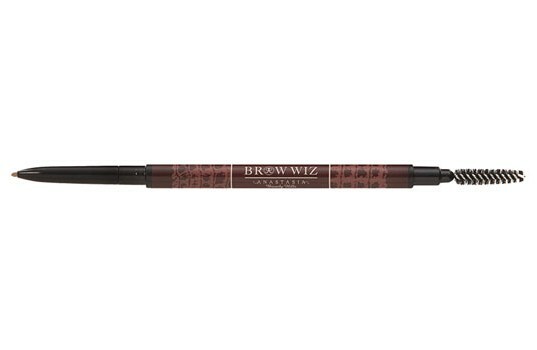 These pencils are definitely not as smooth as the Anastasia Brow Wiz, but I prefer it more that way, so that I do not overdraw my eyebrows. 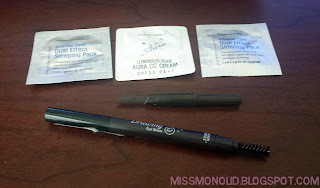 The Etude House pencil also comes with a slant tip, which makes it easier to fill in larger portions of your brows, as most asians tend to go for a heavier brow look, or it is more in style currently in Korea and other asian countries, more brows tend to make a person look younger, which is what most asian girls look for, for that uzzlang look. The pencil also comes with a small spoolie brush, much like the one that comes with the brow wiz, and they sell refills, so you don't have to throw away an entire pencil. I love how thoughtful Etude House was with their packaging, and I'm definitely in love with this eyebrow pencil! In short, I love this pencil, and I would definitely recommend trying it if you are looking for a cheaper, easier to use alternative that is in pencil form!